Prime Minister Netanyahu declined to say whether he now believes in a two-state solution, saying it was up to the PA to prove that a sovereign state would not threaten Israel. Netanyahu’s conditions for a final status deal have not changed: He said as he has in the past that it is critical that Israel retain “overriding security” control in Judea and Samaria, and that it control airspace. “If you say Israel’s airspace stops at Ben Gurion Airport, well, we’re dead,” Netanyahu said, noting how close Israel’s international airport is to Judea and Samaria. However, in his remarks Wednesday — echoing a similar conversation he had Monday with Israeli journalists following his meeting with President Donald Trump and a conversation with American journalists on Tuesday — Netanyahu retreated from forecasting a two-state solution, language he had previously embraced. 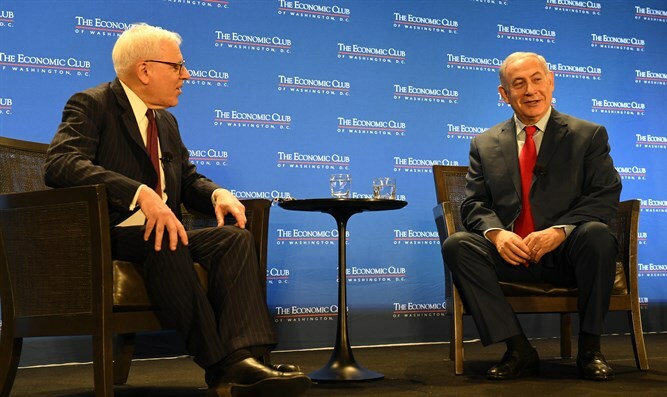 “Most people would agree to an arrangement of the kind you’re talking about if the Palestinians wanted a state next to Israel,” Netanyahu told his host, David Rubenstein, the president of The Economic Club, which brings together the Washington, D.C., business community with diplomats. Rubenstein, a financial consultant and philanthropist, had asked about a two-state solution. "The Palestinians want a state instead of Israel," Netanyahu said. Netanyahu said the media overstated his tensions with former President Barack Obama, but also acknowledged he had better relations with Trump, who has embraced Netanyahu’s rejection of the 2015 Iran nuclear deal. “I had very good relations with all three of them but I disagreed with them” on Israeli national security issues, Netanyahu said, describing his interactions with Obama, Trump and Bill Clinton. He cited Obama’s deal with Israel guaranteeing it $38 billion over 10 years in defense assistance as an instance where he “deeply appreciated” the previous president. Netanyahu’s overarching message to the crowd of businesspeople: Invest in Israel, a leader in technological innovation. “If you’re not in Israel, you’re falling behind,” he said. Netanyahu credited Israel’s intelligence services as a main driver of its economy. He said the skills acquired during military service helped create generation after generation of entrepreneurs. In absolute numbers of personnel, the prime minister said, Israel had the second largest intelligence collection community in the world after the United States. “We convert that sunk cost into thousands of startups,” said Netanyahu, using a term that describes unrecoverable spending.